The Walmart Canada coupon portal has a brand new offering today. 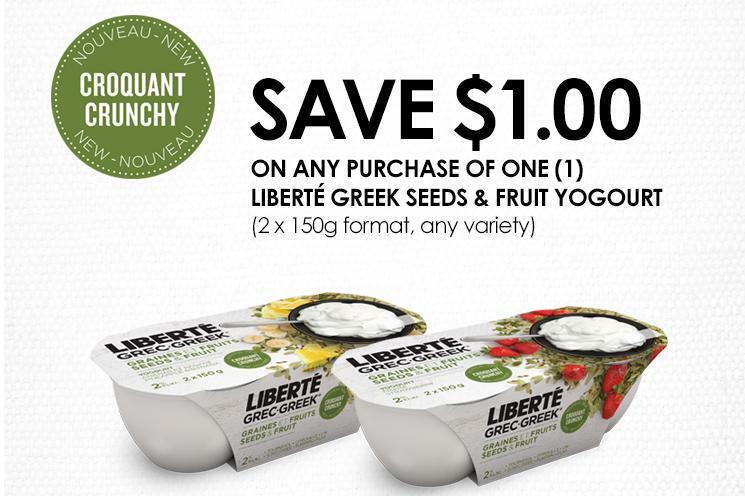 Save $1 on the purchase of new Liberte Greek Seeds and Fruit Yogurt with this new coupon, which you can print, or order by mail, whichever you would prefer. The coupon is valid on the 2x150g format of the yogurt, in any variety. It appears that the product is currently available in two different flavours, pineapple and banana, and strawberry. The “seeds” are a mix of whole sunflower, pumpkin and flax seeds which complete the creamy texture of the 2% Greek yogurt. The 15o gram bowl format is a more substantial size than more single serve yogurts, providing 50% more yogurt, and 12 grams of protein. Click here to sign in to your Walmart Canada coupon portal account to access the coupon. If you are new to the portal you will have to first create a log in different from your existing walmart.ca account.